President Martin Van Buren sought a middle course between the issues of the annexation of Texas on one hand and abolitionism on the other, yet in the process lost the support of southern Democrats, including elderly statesman Andrew Jackson. The artist shows Van Buren’s cautious walking of the middle line, portraying Van Buren as a dog with a fox’s bushy tail that is leading his master (Jackson) astray. Though Jackson worries he is being led astray, Van Buren insists, “We must take a middle course, boos. Salt river is on one side, and abolitionism is on the other.” To their left is a man wearing striped pants, holding two dogs with the heads of James Polk and George Dallas and saying to Jackson, “Here, Almighty sir! are a couple of pups well broken, who will come when you whistle for them & go where you wish. 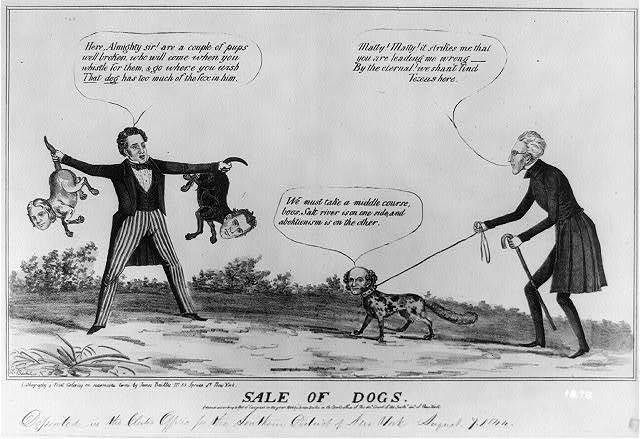 “That dog” has too much fox in him.” Just a few months after this cartoon was published, Polk and Dallas were chosen Democratic nominees over Van Buren.